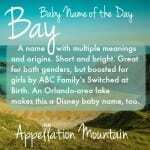 It’s a name from myth brought to life by Disney animation. 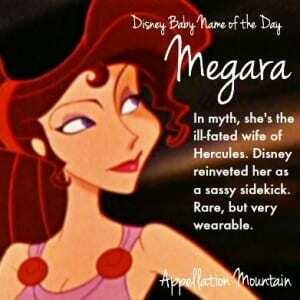 Thanks to many suggestions, our Disney Baby Name of the Day is Megara. In Greek myth, this name belongs to a princess of Thebes. Megara was married to Heracles, after the legendary hero defended Thebes from almost certain doom. Despite being arranged, the pair fell in love and had two children – but no happily ever after. Hera had long hated Heracles, and now she cursed him, causing temporary insanity. In his rage, he killed their children, and in most accounts, his wife, too. Herc’s twelve labors were in atonement for his unforgivable acts. A quick word about our hero’s name: Heracles is the Greek, and Hercules the Latin. But Hercules is the far more common form – even when all of the other characters’ names are given in Greek. Besides the ill-fated princess, Megara is also the name of an ancient kingdom in Greece. Back in the day, Megara was a busy trade site, known for wool and livestock. The legendary founder of Byazntium, Byzas, was born there in the seventh century BC. Centuries later, Saint Jerome described the residents as “generous” in building temples. The name still appears on the map today, though it’s used for a smaller municipality rather than a kingdom. There’s no shortage of movies and television series featuring Hercules. In 1997, Disney put their own spin on the ancient tale. For their purposes, they reinvented Megara, giving her a ponytail and an affection for the color purple. They also gave her a different backstory. Disney’s Megara was madly in love. Only her beloved died, so she set off on a treacherous journey to the Underworld, where she bargained with Hades for her beloved’s return to life. Hades agreed – on the condition that Megara become his faithful servant. She agreed. Hades held up his part of the bargain, and Meg’s beloved? Deserted her as soon as he was restored to life. In the movie, Hercules is working his way through every challenge that comes his way on his quest to become a hero. Meanwhile, Hades is plotting to overthrow Zeus. Hades tells Meg that it’s her job to find a way to stop Hercules. She balks, so he offers her an incentive: stop Hercules, and she’ll be free. I’ll skip the spoilers, but it’s Disney – so you know there’s a happy ending. The character is loosely – very loosely – based on the mythical Megara, as well as a few other stories from Greek myth. But as a character, Meg is thoroughly modern. We’re borrowing plenty of names from legend and myth these days, from Finn to Atlas, Penelope to Juno. It’s possible for parents to discover Megara in Greek myth, and choose the name without ever seeing the 1997 animated version of the character. And yet, the Disney movie was fairly recent and broadly known, followed by a direct-to-video prequel and an animated series on the Disney Channel. So it seems likely that any Megara born today would eventually be asked if she was named for the Disney character. And yet, that doesn’t mean the name won’t work. With built-in nickname Meg, and possibly Maggie as well, Megara is a rarity that feels wearable. How rare, you ask? Very rare. Megara has never been given to five girls born in the US in a single year – not even 1997/1998 when the movie was new. Should you decide to name your daughter Megara, she might be one of one. But with a great, animated namesake, her name will never be completely unknown. What do you think of Megara? Is it wearable? I’ve loved the name ever since I first saw the movie as a young child. It’s definitely wearable! 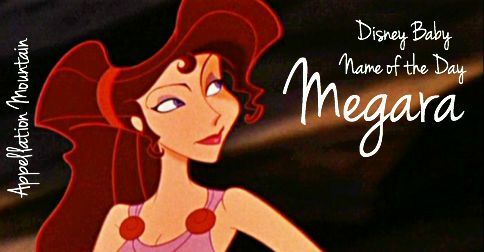 Megara was the name of one of my imaginary daughters, growing up. Wow, I’m really surprised that Megara is so rare! Hercules is one of my favorite animated movies, historical inaccuracies and all 😉 I wonder if the original myth puts people off, or if they’re more inclined to use Meg by itself? I always liked that Meg was maybe the only Disney heroine who starts out on the dark side (not to mention the most sarcastic…girl after my own heart!) As a kid, I would have loved to share a name with her. I also wonder if it is the pronunciation? The first time I heard Megara say her name, I thought “What? !” I tend to say me GAR ah, but she’s MEG ah rah. Then again, if the first time you’ve heard it is the movie, then there’s no reason MEG ah rah isn’t all sorts of fabulous. I actually like this one, especially the built in nickname. 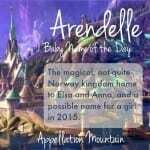 I’m really surprised how much I am enjoying this Disney themed week of names, a lot less obvious than I was expecting. Thanks Abby! You’re welcome! 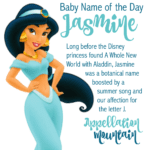 I’ve enjoyed it, too – surprised how big the overlap between Disney/baby name fans is!